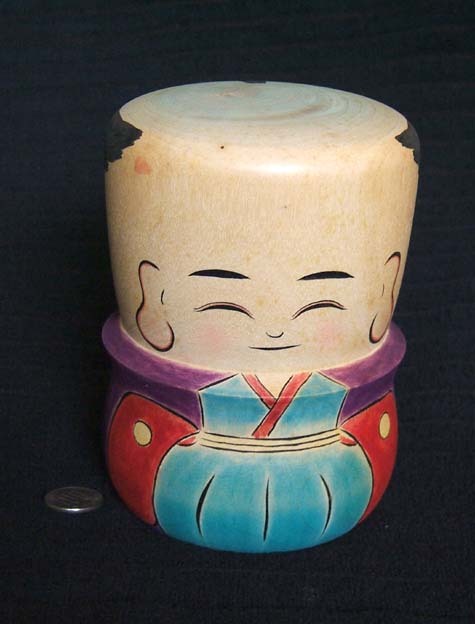 This top depicts Fukusuke, a popular doll figure in Japanese and Chinese culture. Fukusuke figures in Japan go back to around the nineteenth century (Edo period), where they were often enshrined at brothels and tea houses as bringers of good luck. Their use has since widened. Fukusuke figures are typically shown to be sitting in traditional seiza position while prostrating themselves. Hiroi-sensei has made this depiction of Fukusuke as a figurine, not a top.